Standing in the heart of downtown Duluth, Fedo points across Superior St. to a handsome, three-story brownstone building full of offices. The word « POLICE » is still carved in the stone over the door. « The people in the mob believed that six had attacked the girl, so they tried to get six – they only managed to get into three of the cells. There were several people in the cells with the prisoners, asking questions, trying to find out in their minds who the six were among the more than a dozen who were in the cells, » says Fedo. « The people who were outside were saying, ‘Just give us somebody,’ and that first somebody was a young man named Isaac McGhie, who was just thrown from the cell to the hands of the mob who took him out front, brought him up the hill here one block, where he was the first one hanged, » Fedo recalls. 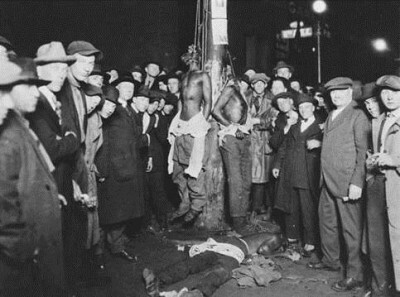 « This is where they were brought to be hanged. I don’t know why they would have been brought up the hill instead of down the hill. But it may have been because there was a young man perched on top of this pole, and they just assumed, ‘He’s already there, we’ll take them up there, we’ll have this kid tie a knot on the lamppost above the street, and take care of business that way,' » says Fedo. « The one that quite stood out is the fellow who’s to the left of the bodies who is beaming. He looks like he’s very proud of what has transpired, and that is the face that really stands out to me, » says Fedo. 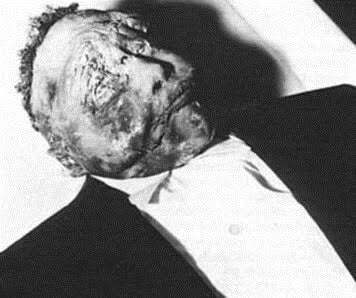 But though Emmett Till and his family never received justice from the state of Mississippi, the wave of activism spawned by those who were inspired by the sight of his mutilated body brought justice of a different sort. 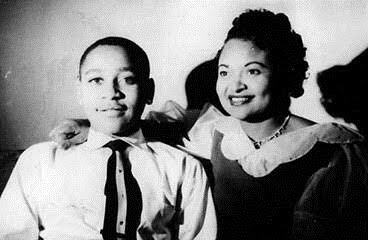 The face of Emmett Till would inspire Rosa Parks not to give up her seat on a public bus in Montgomery, Alabama later that year. It would inspire nine African-American schoolchildren to desegregate Little Rock Central High School in 1957. It would inspire sit-ins in Greensboro in 1960, and Freedom Riders in 1961. It would inspire voter registration drives, and a letter from a Birmingham jail cell. 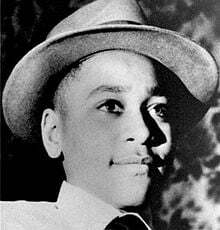 It would inspire over 300,000 people to march on Washington, and millions to dream of a day when people would « not be judged by the color of their skin, but by the content of their character. » It would inspire the Freedom Summer of 1964, and the Voting Rights Act of 1965.